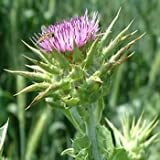 Milk thistle growing herbaceous of the genus Silybum also known as Silybum marianum, Milk thistle annual or biennial plant also used as ornamentalmedical plant, can grow in mediterranean, desert, temperate or subtropical climate and growing in hardiness zone 6-11. 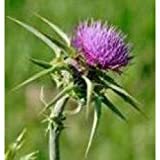 Leaves edible in the color green sometimes with white lines in the edge of the leaf there is spines. Flower head edible and there is spines, the color of the flower purple and rarely white and even pink. Green leaves sometimes with white lines in the edge of the leaf there is spines.